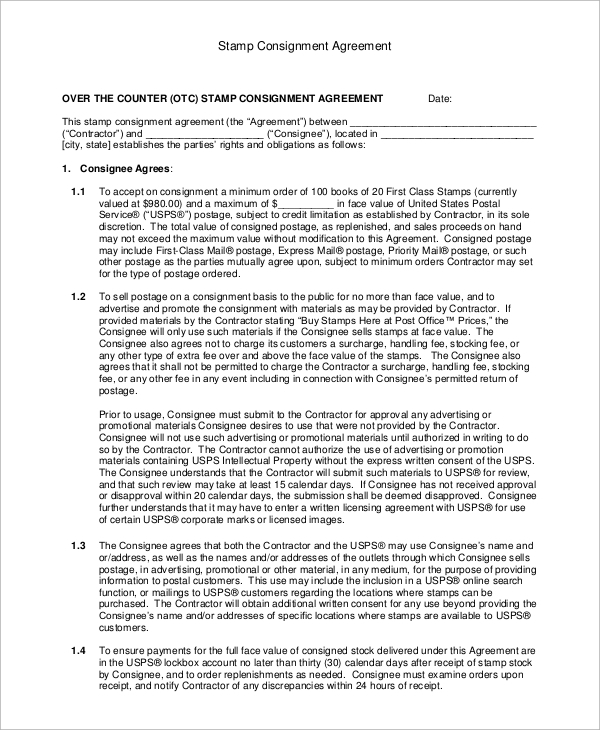 Consignment contracts are an agreement that a consignor and a consignee signs for storage, transfer, and sale of certain goods or items. The consignor still retains the ownership of the items up for consignment until they are sold. Consignment agreements give the consignor and consignee a good protection regarding the sale of the items. 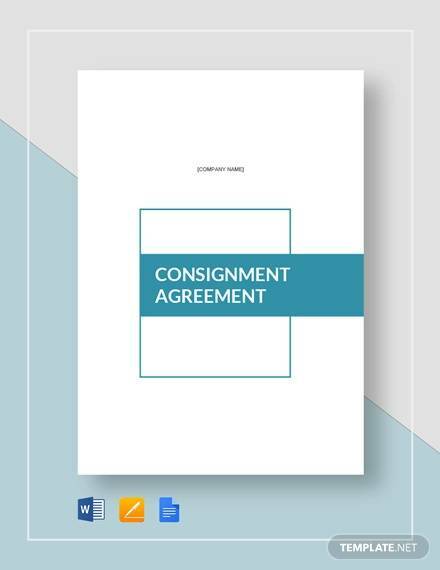 If you need good and high-quality sample templates for consignment agreement, we have a couple of sample consignment agreement templates to download directly from this very article. To give you a bonus, we even have a couple of tips about how you can come up with a good consignment agreement that would be easy to comprehend and would outline everything in detail. Just keep reading. You are sure to find out more. 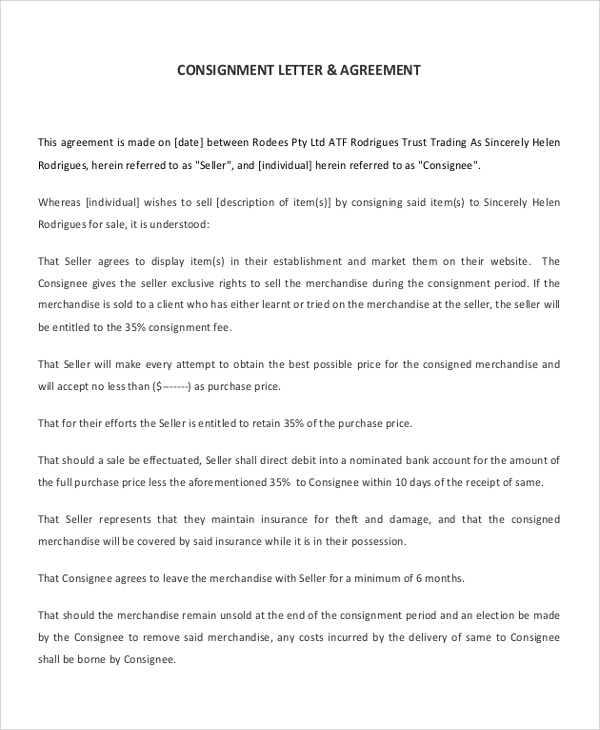 There are a couple of steps that you need to follow if you want to be able to successfully come up with a consignment agreement that is well written and is effective. In this part of our article, we will give you a step-by-step guide on how you can do just that. 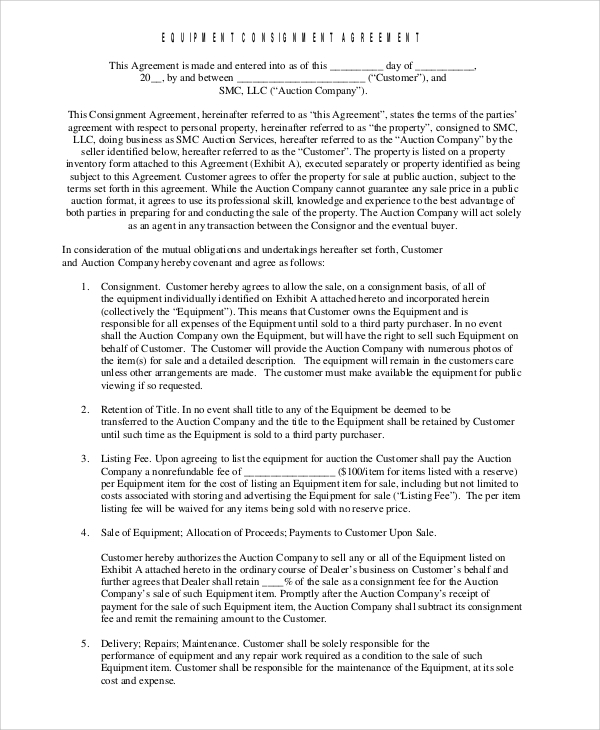 You may also see Consignment Contract Templates. All the members are mentally capable to understand what is stated or reflected in the agreement. Even if the party involved is of legal age, it does not necessarily mean that he/she has the mental capacity to comprehend agreements, so make sure that this is not overlooked as well. All members are sober or not mentally impaired upon signing of the agreement. Otherwise, the agreement will be considered void. Ensure that something of value is given up by all parties. Legal agreements require that one party gives up something of value in exchange for another thing that is also considered to be of value. For consignment agreements, it is understood that an owner of the store will display the items of consignment and sell them in exchange for a commission for every sale made that would be received by the consignee. You may also see simple agreements. Thoroughly discuss terms and conditions. When it comes to agreements and contracts, an offer should be made and accepted in order for it to become legally binding. Before coming up with a rough draft of the agreement, the parties involved should make sure that they are all on the same page about the clauses and the provisions that will be included in the agreement. Setting up a meeting in advance will help you save time since there will be no need to keep revising the agreement. 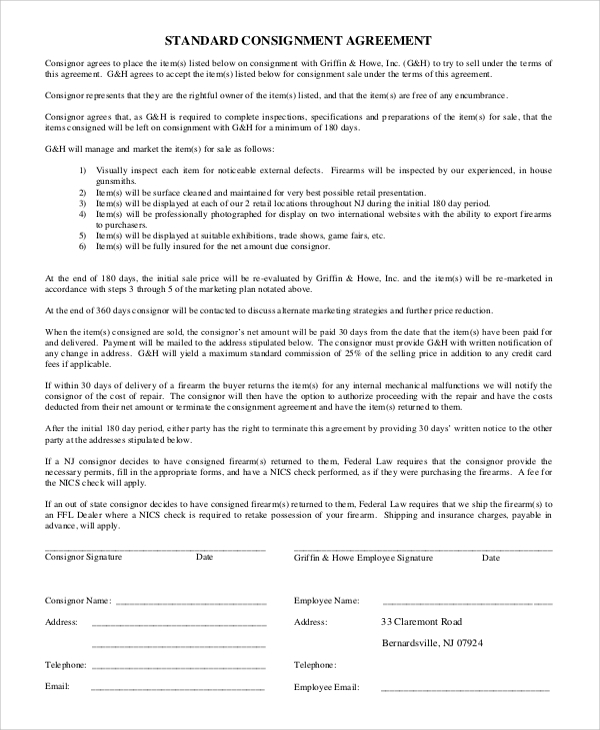 You may want to check out our Terms and Conditions Samples in order to have a good idea about how you can structure the terms and conditions of your consignment agreement. Do not hesitate to negotiate. You have to always make sure that everyone is on the same page when it comes to agreements. Fairness and equality for all parties involved must be achieved. Set a time frame. You have to face facts that not all items on display will sell. Setting a time frame for the items about the length of time that they should be displayed and when they should be returned to the owner should it not sell would be a great idea. This way, the store will not be overloaded with the items and will avoid the possibility of losses. 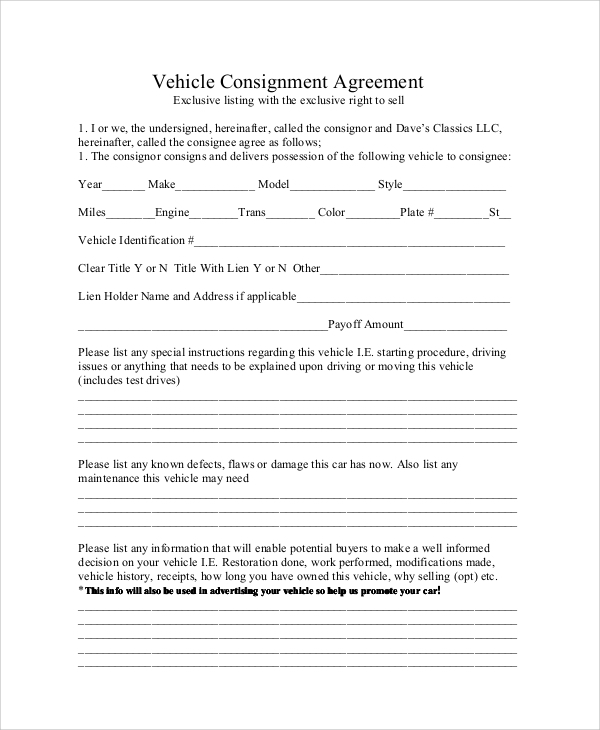 You may also see sample consignment agreements. Dispose of the unsold items. Offer to return the items to the owner. Determine the price of the item/s. How the items will be priced will all depend on what the item is and how it was produced. Referring to other physical stores and online stores can help you come up with pricing your items in a competitive manner. You may want to check out our Price List Samples and Templates article in order to have an organized list of the appropriate prices for the items that you would have for consignment. Determine shares each party will get. Store owners shell out more money when it comes to these items because these items take up shelf space in the store, the store pays for rent, the store pays for utilities, and more. Sometimes a 50-50 deal is what would be agreed upon; however, negotiations can be done in order to make everything fair for both parties. 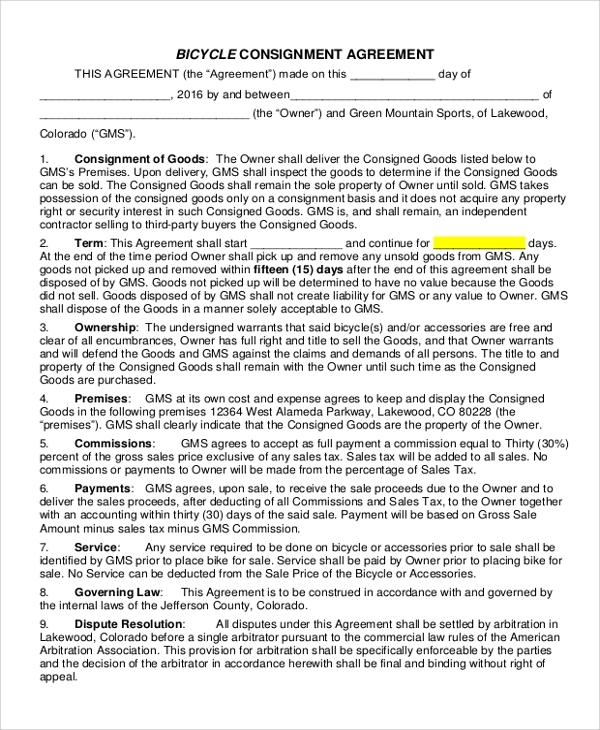 You may also see agreement form examples. Payment terms and options. You have to be clear about how the items will be paid and how frequent payments will be made. It can either be upfront or through an installment plan. Explain who will be responsible for damaged items. Give a good explanation about who will be responsible should any of the items be damaged or destroyed. Parties may want to negotiate this claim in a fair manner. Start with the most basic information. Start with the names of the people or the names of the companies involved in the agreement. Include all the terms and conditions that have been agreed upon. Include everything such as payment terms, legal clauses, and an explanation regarding who would be liable for items that are damaged or destroyed. 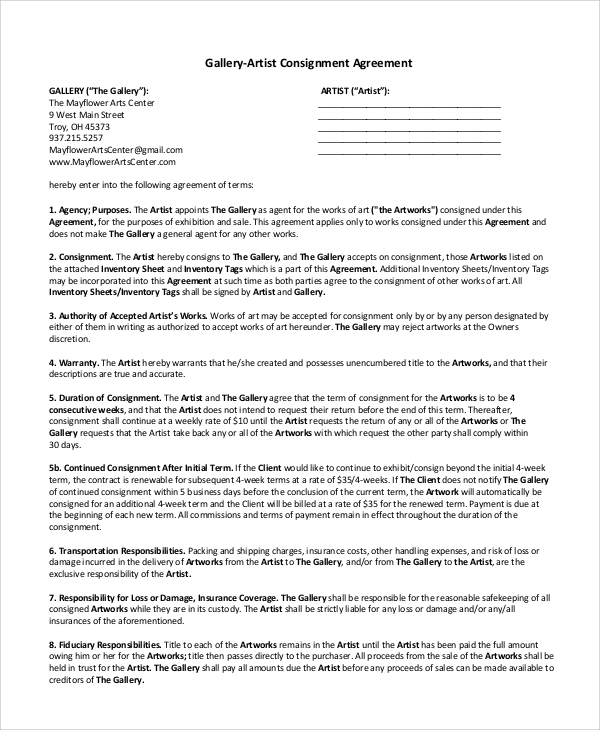 You may also see agreement form samples. Write everything in detail. Clarity is what you want when it comes to whatever kind of agreement you are coming up with. There is no need for you to write flowery and complicated words. Sticking to simple language that is easy to comprehend is highly preferred for agreements. 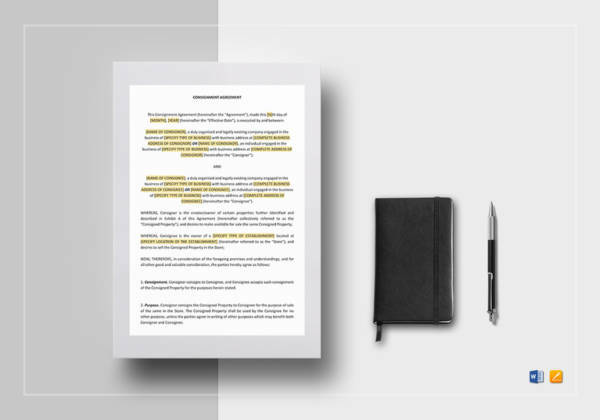 Putting everything into detail will help to make your agreement less confusing. 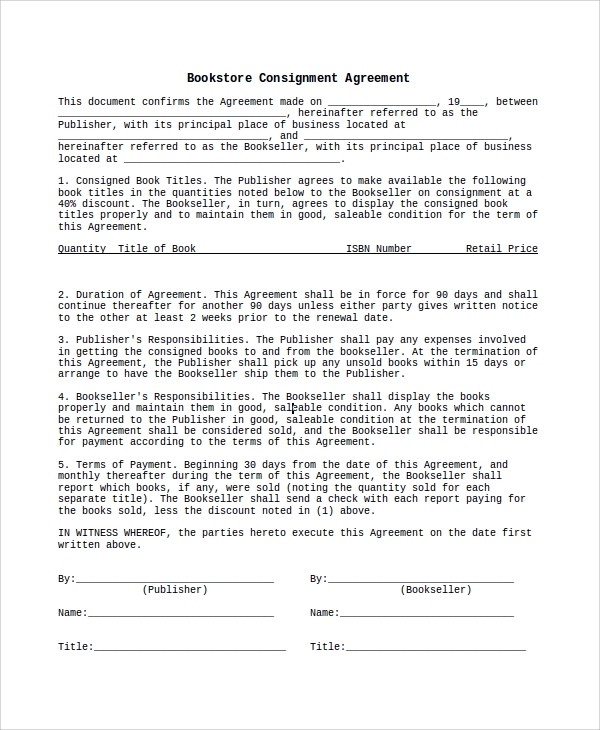 You may also see agreement form formats. Include termination clauses. Make sure that you include any situation that would make the agreement terminable. Make sure that you also include how long the agreement will last. 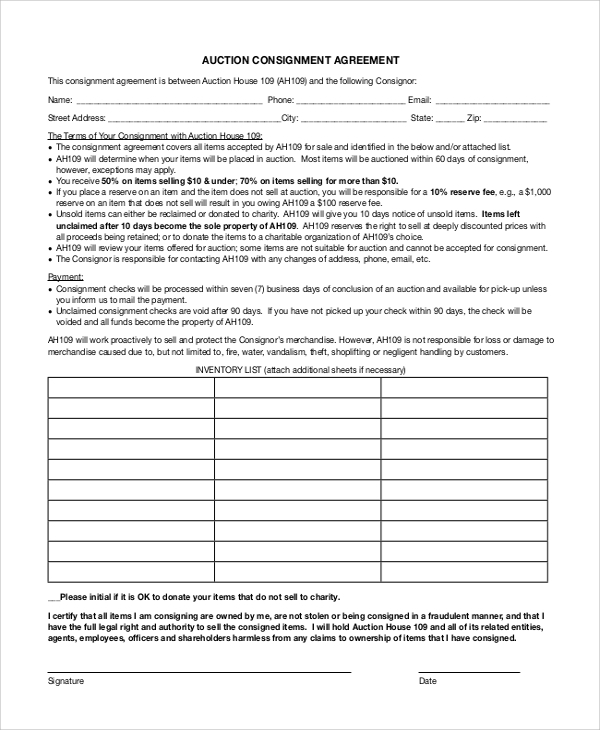 Provide a page for signatures. 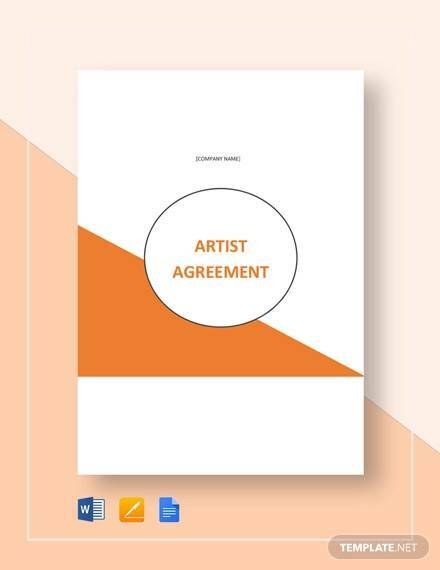 Make sure you provide a page or space where the parties involved can sign the agreement. Know what will happen once the agreement has been signed. A signed agreement will now be considered as a legally binding document. This means that if there is one party who does not do the responsibilities he/she is assigned to once the agreement has been signed, the other party may sue the party who committed a breach or the other party may recover from the breach through monetary means. You can look up remedies for contract breaches to ensure that you know what to do should it happen to you. 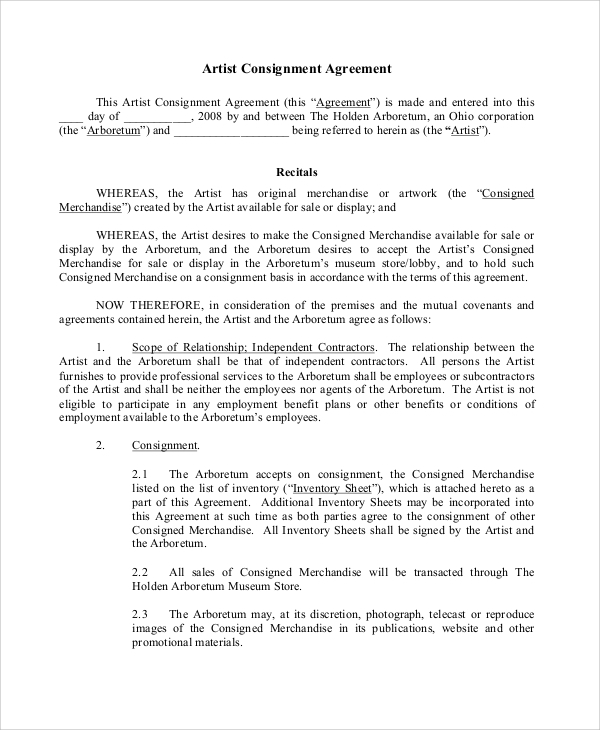 You can find out more about how you can come up with a good consignment agreement by reading up on our article about how to write a contract agreement. 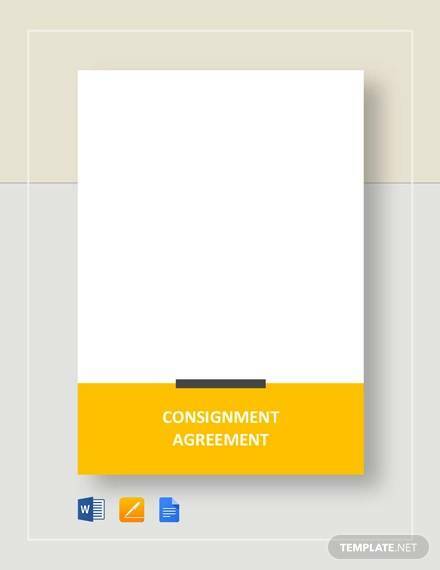 Need a a template for consignment notes? You may want to check out our consignment note samples.